Wednesday dawned sunny and a little windy. As the day wore on it became cloudy and a lot more windy. Harmony and Peace woke up to some nice fresh fish. Harmony is advancing well for her age and tried self feeding 4 different times today. She even mastered the one talon hold down technique. Peace kind of watched and looked at Harmony like “wait till I try that!”. Mom and Dad had a small tug of war over a fish and some nestovers. Mom thought she had won but Dad out-waited her and had the last laugh. Mom and Dad both brought in some new furnishings and the kids help move them around when the parents weren’t looking. But, the big news of the day was the bugs are out in force. All four of our residents seemed to be bothered today by a plethora of gnats and other bugs on the nest. Well, they do say the mosquito is the state bird of Minnesota! It just so happens that at this time every year the bugs wake up, hatch out and seem to infest each nest and bother the eagles. 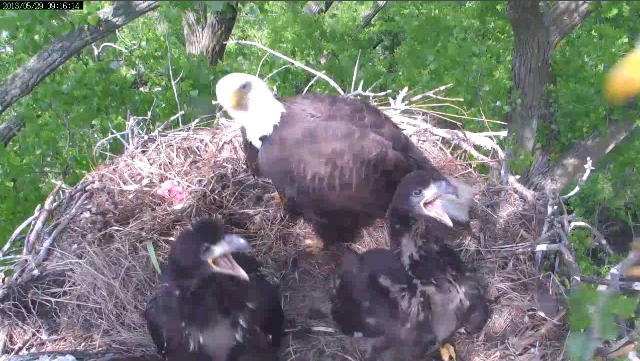 Unfortunately the eaglets have to live with the bugs as well as the smells of the nest as the weather warms up. Harmony and Peace are getting along really well by themselves on the nest. They built a fort together today and they relax and cuddle without much in the way of beakering. Late afternoon Mom brought fish for dinner and the kids had a very satisfying meal. Mom stayed and chased bugs for a while and as darkness fell she was on gnatguard in the nest. Mom and Dad behave like 2 bad neighbors. The kids build a fort from grass. A little flap here and a little flap there! What are those geese up to now??? Ok, Peace, watch how you do this! Must you??? I tryin' to nap here!! Wadda we gonna do for the other three walls??? Yo Dad! I can preen myself! A flip of the fish to Razzle and BBC for the great pics and vids today! Thanks! I hope you all had a wonderful day on the nest and we’ll see you here tomorrow. Please bring a flyswatter!